And now for something a little different. No, don’t be alarmed yet- we’re just letting Chris write the blog post this week! When developing an early-access game, you have to make a lot of choices about what to prioritize. Do you fix that bug, or implement this new feature? There’s an endless list of things to do and only so many people to do them. Sometimes things that work ‘well enough’ get left alone for long periods – until the time for a rework finally comes around. And this month the time has come to address Immigration. The initial immigration system was one of the first events we added to the game so that population would grow over time. Getting more people ​is a pretty fundamental part of playing a colony simulation game, after all. The system, however, was built on many assumptions that made sense during our earliest-access period, where starvation was the biggest threat – and that’s not how things work anymore. Gaining 3 prestige for taking 3 people is basically a win-win situation, and no-brainer choices like this don’t make for interesting gameplay. Prestige favours only added to this imbalance, as it was possible to more than double your rate of immigration by constantly “buying” new colonists – not at all what we intended when the system was first implemented. Back in the day you needed about this many cabbages to feed everyone. 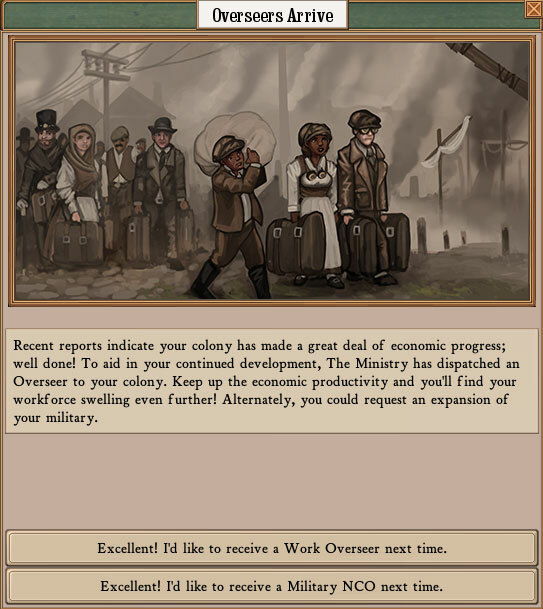 As we’ve added content to the game, it’s becoming more and more necessary to slow down the acquisition of commodities and population, to allow players time to experience the progression and sense of growth – essentially, separating things into an “early game”, “mid game”, and “late game” As such, immigration and prestige will be receiving a big overhaul in the next patch to improve the entire progression of receiving colonists. First off, Prestige favours are simply too good right now (as of version 40). We knew this needed some love and were planning a rebalance, but it became utterly clear when I put in the new immigration system and asked for feedback; pretty much everyone was using all their prestige to buy huge numbers of free redcoats and artisans. Why worry about a few more lower-class citizens when you can get a ton of higher-quality ones for less cost? When we first added prestige, it was meant to patch over a colony’s flaws and allow the player to fill gaps and solve problems; however, at this time it has supplanted immigration entirely. With the flood of (permanent) colonists from prestige favours effectively capped, the next step is to rebalance the immigration event itself to create a solid progression arc for the game. The most radical move we’re making here is splitting lower-class and middle-class immigration. There’s a pretty simple reason for this; while lower-class immigration simply affects how fast you can get things done, middle-class immigration acts as a hard cap on the number of things your colony can do at once. The chance of receiving an overseer being completely random is frustrating, and is a big part of why ‘buying’ overseers via prestige was so common. Now chance is no longer a factor – while lower class immigrants are kept on a simple time-based system, we’re moving middle-class characters to an economy-based system that should supply them to the player around the time when the player is looking to expand their industry – and prevent any micromanage-y shuffling around of overseers between this and that building whenever they want things done. More on that in a bit. 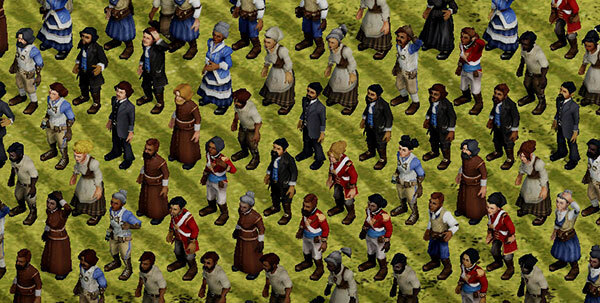 With regards to lower-class immigration, the first step of a rework actually went in last patch; as before, players get a steady flow of immigrants every few days, but now instead of choosing between artisans or random people, players can either accept a standard group of lower-class immigrants or can use prestige to buy a higher or lower amount of people. This allows a fairly steady rate of progression no matter what the player is focusing on – you can slow down and focus on fewer but denser work crews, spend lots of prestige to rush as many people as possible, or halt immigration entirely if you’re having food problems. While in the last patch, this supplied a random group from lower-and-middle-class, this event has now been confined specifically to the lower class, and follows a fewer-immigrants-early-on more-immigrants-later-on arc that – I’m hoping – will provide a satisfying sense of growing from a small colony to a bustling town. The new middle-class immigration event. Aristocrats will be arriving in an entirely different fashion that we’ll discuss… later. Finally, the real tricky part: middle-class immigration. We need to make sure players working on expanding their economy receive the overseers they need – basing this on time just isn’t an option. And simply handing out overseers every time you build a workshop would be far too restrictive to players who want to follow their own economic path. Instead, we’ve created a system that measures your “economic productivity”. Each commodity you harvest or create is tracked and sorted into tiers by how much relative effort they take to create. These tiers are then added together to form your current “economy score”. Every time you hit a certain milestone of economic productivity, the Empire sends you a new overseer. (You can also ask for an NCO instead.) Right now the milestones are based on some informed calculation and testing, but we’ll definitely be refining and rebalancing the numbers as we get player feedback. Making big changes to all these systems at once is a pretty scary undertaking, and I’m looking forward to putting out an experimental build so we can find out how design meets reality. More than anything, though, I have high hopes that the combined changes will make for much more interesting and variable colony progression than the previous system. This long-term refinement of gameplay is what’s great about early-access: The ability to test ideas out in the real world, get useful feedback, and turn that into an even better game. Hi Chris! Congratulations on being given the very important non-development task of writing a blog post! It’s like being asked to make the coffee, but with more writing. Can we really trust Chris with this important task though ? He has yet to prove his Worth and Loyalty to the Empire ! Hullo Chris – looking forward to sinking a frightening amount of time into the hunt for the glorious Secret Cabbage Level. Our greatest hope has become manifest! Hai Chris! Yay for blog posts! YAY! Thank you for fixing what was making the difficulty…non-existent. Not very lovecraftian to make stuff easy, now is it? Linux client??? Is there any chance to see this working on linux? I’ve bought this game long ago and i can still not play it. There is just too much economy here! I need men to protect my economic growth right now! Station them right besides that barn that’s filled with progress and I can sleep peacefully tonight. On a serious note, how will the new system handle the colony losing overseers to ominous events? At first glance it looks like you can trap yourself with one or two surviving overseers and an impossibly high economic milestone. On the other hand, Cabbage level, reveal your secrets to me! I was also wondering how the system would deal with deaths. It wouldn’t be right for the game to simply expect you to make do with one less overseer on a permanent basis. But fully knowing the game will send a replacement also seems unsatisfying. I have thoughts on how to do this – but I’m definitely not going to just give you a free person immediately, I’ll make you either work or wait for it. The actual details will depend on 1. How balancing the initial acquisition turns out, and 2. how feasible some my ideas end up being. I’ve got some ideas for repopulation systems, but I’d like to get some better balance for actually giving you the overseers at all, first. Right now it’s looking like I was a little generous and people are getting them by the piles; once we have a better arc of acquisition I can use that info to help me balance how often you get them back. Wouldn’t one fix be to allow some lower-class workers to occasionally be ‘promoted’ to middle-class overseers? Or is that not in the game design? We actually used to have this in the very earliest builds, but it was super broken in both gameplay and flavor – like, raising a person’s social class like that is a big deal! It’s possible we may one day implement it again but as of right now it would mostly allow people to break what progression we have, haha. Hullo Chris! Would it be possible to then use more prestige to naturalize these “temporary citizens”, making them a permanent part of your colony?